the Praise Baby video series, it's laid out similar to that. Abigail, God made you and me. So clap your hands, stomp your feet, nod your head, shout God loves me! You're one of a kind, God is with you all the time. 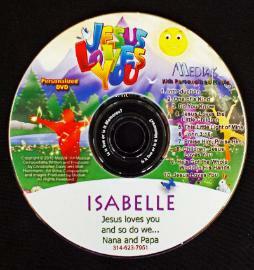 Jesus knows you and He loves you Abigail." put into the chorus to really impact their spirit. For Gavin, the chorus would go, "Gavin, Jesus loves you. really drives the message home.